The 39th US President, Jimmy Carter has showered glowing encomiums on Nigeria’s former President Goodluck Jonathan, describing Goodluck Jonathan as a symbol of democracy on the African continent. 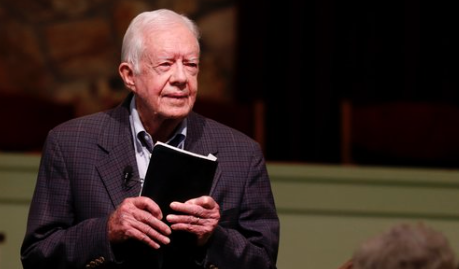 President Jimmy Carter made the remarks while receiving Jonathan at the Jimmy Carter Presidential Library and Museum located at the Carter Center in Atlanta. The two former Presidents were said to have held a fruitful meeting at the Carter Center where they held a wide-ranging discussion on global issues and shared views on how to promote peace, democracy and good governance in Africa and the world. Jimmy Carter also praised Jonathan for organizing a transparent election and easily conceding defeat and handing over to the opposition. By so doing, he said that “Jonathan showed his deep democratic commitment”. Goodluck Jonathan in reply said that his actions while in office were informed by his belief in a peaceful, transparent and people-oriented governance, adding that Africa can only move forward through democracy and good governance. He commended President Carter for the exemplary manner he had in his post-presidential life, adding that he was inspired by Carter’s commitment to causes that advance the path of humanity. Goodluck Jonathan and Jimmy Carter both share a common experience as one term Presidents and have both retired involuntarily from politics while rededicating their lives towards making the world a better place.